Hey, do you want to know how my Dubai winter veggie and flower garden is doing? It's going great. The usual suspects are up and about, like basil, tomato plants and sunflowers. Those are the plants that I know would grow under any circumstances (which include days of neglect). Others are having are difficult start, but seem to decide to bear with me: mint, chilis, green and fava beans, water melon and a few flowers. Yet others will not bear fruit during my lifetime if they keep on growing so slowly: oregano, thyme, strawberry, rosemary. But the most rewarding vegetable so far was arugula. I have about a square meter of arugula growing in my garden, far too much to just put into salads. So I made pesto out of it some time back and kept it in the fridge. The other day, I had an incredible appetite for a pasta lunch (it was the day after my Half Marathon race and I was obviously still needing carbs to help my tired muscles recover from the race). 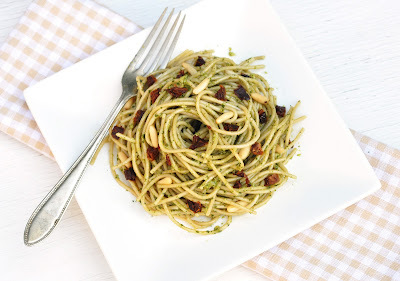 What's easier than mixing pasta with a little pesto that is waiting to be used!!! Throw in some sun-dried tomatoes for some zing and toasted pine nuts to add some nutty sweetness. In less than 15 minutes you'll have the most delicious pasta meal. Definitely a keeper, especially the pesto in the fridge. I made enough pasta for 2 days and had leftovers the next day. Good and healthy enough for any lunch box. Bon appetit! Combine arugula leaves, nuts, garlic, lemon juice and Parmesan cheese (if using) and blend in a food processor until it becomes a smooth paste. Slowly blend in the olive oil (only taking small amounts at a time) until fully incorporated. Season with salt and pepper. If you don't use the pesto immediately, keep the pesto in an airtight container, covering it with a layer of olive oil to prevent it from going off. Keep in the fridge.